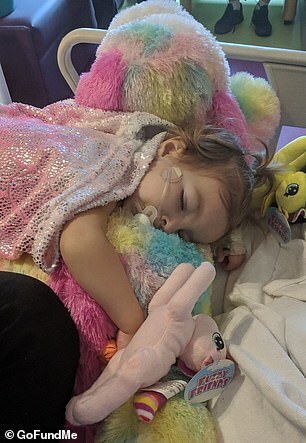 A two-year-old girl is battling ovarian cancer in an incredibly rare case. 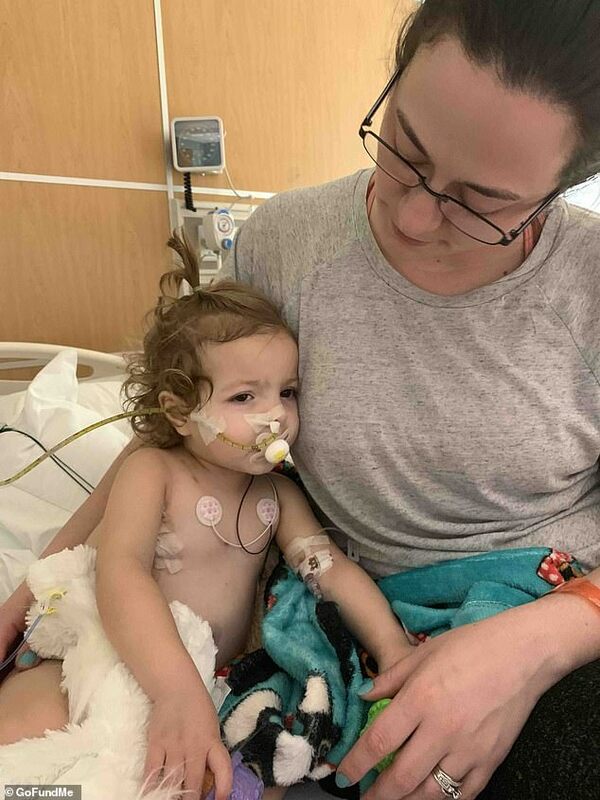 McKenna ‘Kenni’ Shea Xydias was diagnosed with ovarian yolk sac tumor on February 15 after developing a 103F fever and a bloated belly. At first, her pediatrician in Senoia, Georgia thought she had a bubble of gas in her bowels, judging by an X-ray. But an ultrasound revealed something more sinister: a mass in her ovaries. 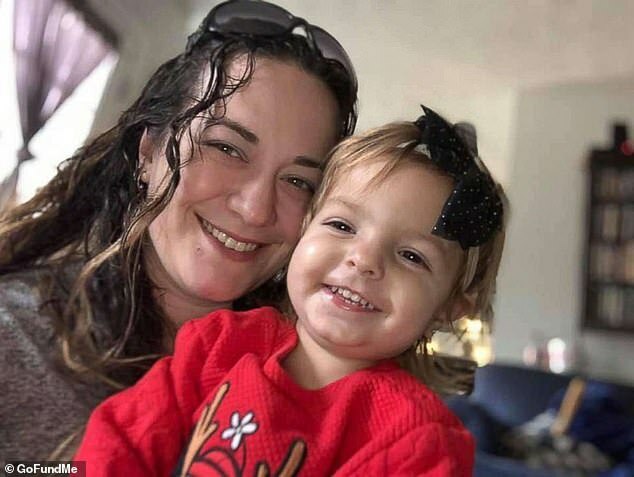 Her parents, Mike and Meagan Xydias, were stunned when the results of her CT and MRI scans came back: tumors scattered all over her abdomen, one near her liver, and one – a staggering 14 centimeters long – on her right ovary. Kenni is believed to be one of the youngest to suffer from this rare type of cancer, which normally affects girls aged 10 to 30 years old. She has had her right ovary removed, and part of her small intestine. 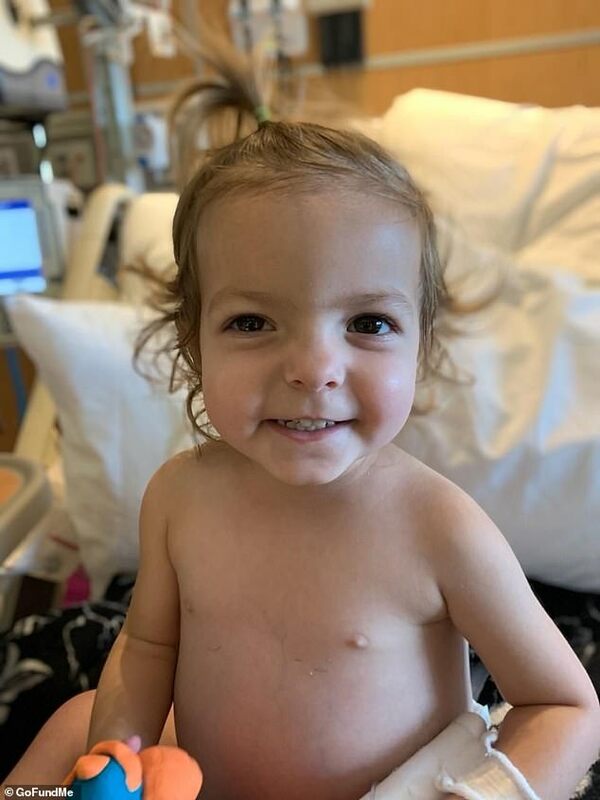 Painfully, as Mike and Meagan arrange chemotherapy and possibly other treatments, they also have to meet with fertility doctors to discuss Kenni’s prospects for childbearing down the line. 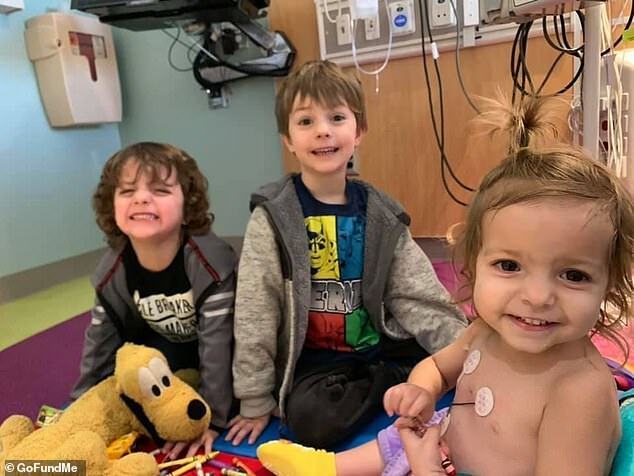 ‘We try to take every day one step at a time, but having to consider how these tumors and consequential chemo will potentially effect Kenni in the long run, forces us to look at the big picture as well,’ Mike wrote on their GoFundMe page on Tuesday. Kenni’s type of cancer (a yolk-sac tumor) falls under the umbrella of Ovarian Germ Cell Tumors, also known as GCTs. They account for 25 percent of all ovarian tumors, including benign ones. Twenty percent of all ovarian tumors are cancerous. Of all the cancerous ovarian tumors, just 20 percent of those are cancerous yolk-sac tumors. In a nutshell: it is not common at all. But the few younger people who develop ovarian cancer are more likely to develop this rare type than the more common types. 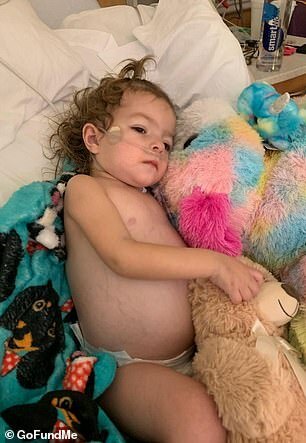 ‘This is very, very rare,’ Dr Robert Wenham, Chair of Moffitt Cancer Center’s Gynecological Oncology Department told DailyMail.com. ‘Growth can be rapid,’ he said, adding that ‘swelling and pain’ are the most common symptoms. According to Dr Wenham, while surgery to remove the tumor is recommended, it’s not clear how effective it is. However, with younger patients, doctors are likely to be performing surgery anyway to preserve what normal ovaries and uterus lining they can for fertility purposes. The most effective type of treatment for patients like Kenni is chemotherapy. ‘Almost all pateints will need chemotherapy, usually with three drugs called bleomycin, etoposide, and cisplatin,’ he said. It’s not clear what chemotherapy Kenni will be taking. 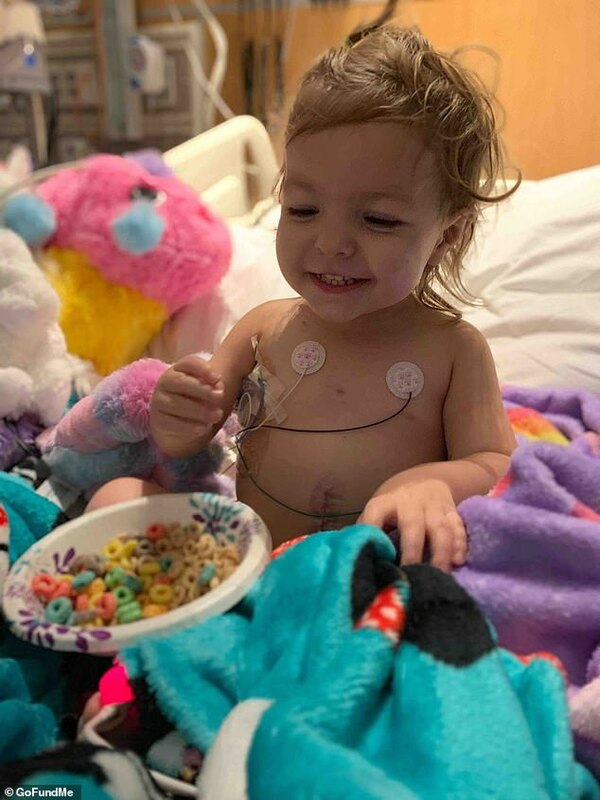 For now, the family is sharing their story, asking well-wishers to keep them in their thoughts, as family friends try to rally funds to pay Kenni’s medical bills. ‘This poor baby needs your prayers,’ they wrote on Facebook. Mike and Meagan, both teachers who recently bought a house and moved to Senoia, have two sons older than Kenni, friends say, meaning finances are tight. Writing on GoFundMe, Mike said the entire ordeal has been surreal. ‘This whole experience has been completely outside our usual realm of normalcy,’ he said.